Brazil Travel / Tours – Caiçara is the name given to one of the traditional communities of the Atlantic Rainforest along Brazil's south and southeast coast. Their origin and habits are similar to the one of the so-called caipiras who live in the interior of the country (Cerrado). Caiçaras descend from the mixture of Indian populations, Portuguese colonists and African slaves. Their daily live consists of artisanal fishing, farming, vegetal extraction, hunting (now prohibited), handicraft,and increasingly, ecotourism. Their agriculture system is based upon an auto - sustainable coivara technique, an Indian heritage, where part of the forest is slashed and burned for a cultivation period of up to three years. After this period, the area rests for a period of 3 to 10 years (fallow period) before being used again. Common crop species are sweet and bitter manioc, beans, maize, rice, sugar cane and bananas. Other subsistence activities are hunting (with firearms, dogs and traps) and fishing (with rods, traps and nets). Some typical preys are agouti, armadillos, coati, capybara and peccary among the mammals such as tinamou, black-fronted piping-guan and toucans among the birds. In order to guarantee the best output, farming, hunting and fishing activites were planned according to a calendar that is based on the moon phases. 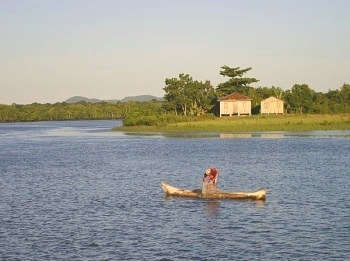 The caiçara culture is threatened by real estate speculation and illegal fishing. This development is facilitated by a large degree of analphabetism, missing education and information as well as the lack of organization and union among themselves. The reason for the latter are mostly property issues, interpersonal and religious controversies such as the lack of communication systems like telephone or post mail. The continuity of the caiçara culture will depend on the provision of basic health care, education ,collective transport, energy, basic sanitation and alternative income sources (eg. ecotourism). You can contribute to the well-being of these cultures in form of a visit to their villages, for instance in Superagüi (PR), Ilha do Cardoso (SP), Juréia - Itatins (SP) or Juatinga (RJ) – Travel to Brazil / Tours.